Keira Robinson handed out 200 assists last season as a freshman. In many ways, VCU Basketball has been defined by its point guards. From Edmund Sherod to Rolando Lamb, Eric Maynor and Joey Rodriguez, the program’s most successful seasons, perhaps more than any other position, have been sparked by outstanding point guard play. At least, that’s been true of the men’s program. The women’s team, however, has been notable for its post players, such as WNBA draft picks Quanitra Hollingsworth, Krystal Vaughn and Courtney Hurt. Not since Rochelle Luckett nearly15 years ago has a VCU Women’s Basketball point guard commanded the court in a starring role. The next great VCU point guard may already be here. Keira Robinson burst onto the scene in 2013-14 with, statistically speaking, one of the best seasons by a VCU point guard in school history. As a freshman last season, Robinson doled out 200 assists in VCU’s high-octane offense, the third most in school history. She and teammate Isis Thorpe were the first VCU freshmen to average double digits in points per game since Hollingsworth in 2005-06. She could be even better this season. New Rams’ Head Coach Beth O’Boyle says VCU will push the ball at every turn in an effort to capitalize on her team’s athleticism on the wings, as well as mitigate some size issues down low. This is good news for Robinson, who’s fast and lean, and loves to make plays in the open floor. It’s a promising marriage of an aggressive system with an enthusiastic pilot. Whatever lies ahead for the Rams this season and Robinson’s career these next three years came perilously close to not happening. Robinson had been a recruiting priority of former Coach Marlene Stollings, who viewed the Columbia, South Carolina native as crucial to her white-knuckle style of play. There were no stop signs in Stollings’ offense. She wanted to play fast and wide-open, and Robinson was more than happy to keep the pedal to the floorboards. And it worked. For whatever issues her youth created, Robinson was able to use her quickness and sharp instincts to direct an offense that averaged nearly 76 points per game. The Rams twice set a school record with 112 points last season. Robinson averaged 11.4 points, 6.0 assists and more than two steals per game. Led by senior Robyn Parks, who averaged 21.6 points and 9.3 rebounds, the Rams finished 22-10 and reached the WNIT. But when Stollings resigned in April to become the coach at Minnesota, Robinson was shaken. Eventually, she decided to transfer closer to home to Charlotte. At the end of the spring semester, she packed her bags and returned to Columbia. It wasn’t long before doubt began to creep into Robinson’s psyche. She was home less than two weeks before the situation came to a head. 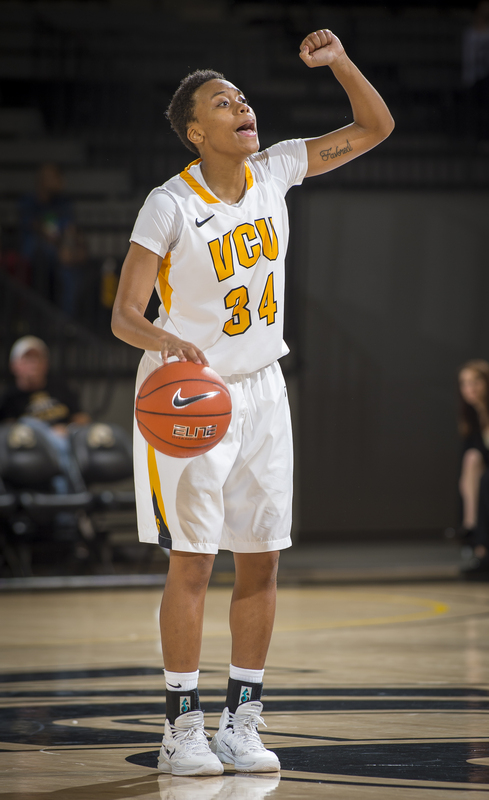 Part of an eight-player freshman class for the Rams in 2013-14, Robinson had formed a strong bond with her teammates. Sure, Robinson admits she missed home during her freshman season, but she also realized she’d found a welcoming place at VCU. To Robinson, the team was part of her family. “Just being home thinking, yeah, I miss home, but I really felt like VCU was my home, and I couldn’t imagine playing the next three years without my teammates,” She said. Eventually, teammate and confidant Monnazjea Finney-Smith convinced Robinson to talk with O’Boyle. “Jeezy (Finney-Smith) and I are close. I know I can trust Jeezy. I felt like, if my teammates believe in this, then I should believe in this,” she said. While there was still a stable of talent for O’Boyle to work with if Robinson didn’t return, it was clear the Rams were better off with their floor general, who handed out more assists than any freshman in VCU history. Months removed from her personal crossroads, Robinson speaks in the calm, passionate tones of a contented player on the verge of her next big thing. As a sophomore, she’ll be a critical cog in O’Boyle’s effort to replace Parks, one of the best players in program history. Despite all the attention she draws for her offensive output, Robinson seems most excited about playing in O’Boyle’s man-to-man defensive system. Under Stollings, the Rams were almost exclusively a 2-3 zone team. O’Boyle has also indicated VCU will be an active pressing squad. Robinson should be excited. On paper, those elements align comfortably with her skill set. “I’m excited about the defense because it shows how hard we work and are going to work to prove a point,” she says. It’s impossible to know what the next three years hold for Robinson and the VCU program, but there’s plenty to feel good about. Robinson’s freshman success and obvious ability foreshadows a bright future. O’Boyle, meanwhile, is fresh off a stunning turnaround of a moribund Stony Brook program. Can Robinson carry the torch as VCU’s next great point guard? It’ll take three more years to know for sure. But thanks to Robinson’s change of heart and the bond she’s struck with O’Boyle in a short time frame, we’ll have an opportunity to find out.